A Maine coloring book invites adults to get unplugged. [Y]ou say you’ve had your fill of adults behaving like children? You’re tired of grown men and women — presidential candidates, we call them — trading insults like schoolyard bullies? Please indulge us for a moment as we make the case for engaging in a little childlike activity of your own. 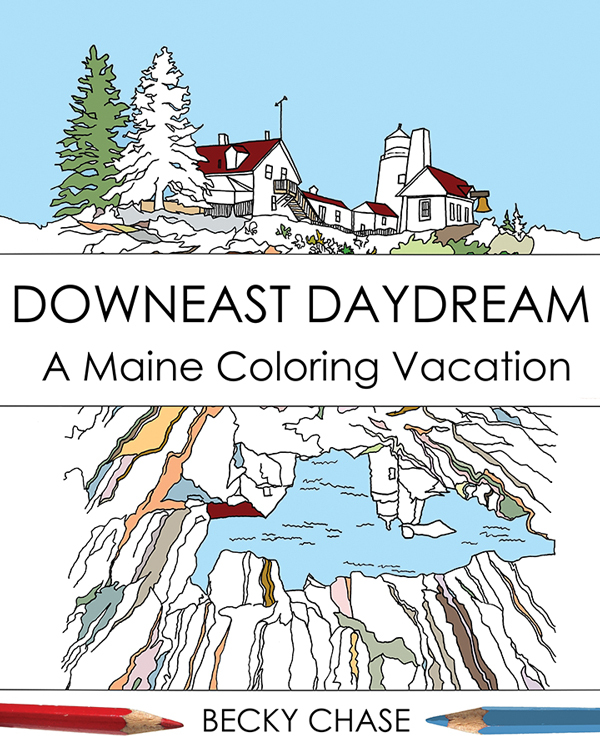 We’re talking about coloring — specifically, scribbling inside the lines of Becky Chase’s 25 hand-drawn images of Maine in her new all-ages coloring book, Downeast Daydream: A Maine Coloring Vacation (Twin Fawn Media, Portland; softcover; 60 pages; $11.99). Think back to those meditative hours you spent coloring as a child, and you’ll understand how Downeast Daydream can deliver sweet respite from the childish antics of certain campaigners, not to mention the relentless barrage of bad news and nonsense inherent to 21st-century life. That, Chase suggests, may be the secret behind the adult coloring book phenomenon, ignited in 2013 by the fabulously intricate drawings in a book called Secret Garden by Johanna Basford and showing no sign of letting up (a recent check reveals six of the top bestselling books on Amazon are coloring books for adults). “It might have something to do with our being online all the time and the need to get out of our heads and away from technology, doing something with our hands,” says Chase, who paints and draws as a hobby (her day job is at a Portland-based firm that creates US internships for non-Americans). Chase’s affinity for the coast is apparent in Downeast Daydream, with its many line drawings of lighthouses, seashells, buoys, and wharfs. There are plenty of other Maine icons here too, including wild blueberries, moose, and the state seal. Compared to Basford’s byzantine designs, Chase’s simple pictures are kid’s play, but they’ll keep you busy long enough to awaken the child within.